W hen I first moved to Mexico in 1990, luxury hotels in San Miguel de Allende were very thin on the ground. Only two of the hotels on the following list existed then. 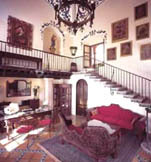 The Casa de Sierra Nevada was generally considered to be the only true luxury hotel in San Miguel. Times have changed...and so have the demographics of San Miguel. There also were no million dollar homes back then. Now the narrow streets and hillsides are littered with them. Money has come to town, and it can provide a whole lot of comfort and pampering at the luxury hotels of San Miguel. Here are the properties you can chose from when you're looking for luxury hotels in San Miguel today. Check prices, dates and amenities for Casa de Aves. Notes: Located outside town on the road to Dolores Hidalgo with a shuttle service into town. Villas have kitchen, living room, dining room and bedroom. Each villa has a private roof-top Jacuzzi. Swimming pool with swim-up bar, herbal steam room, gym, library, open air restaurant. No children permitted. Check exact rates and availability for Casa de Liza. Notes: Built from a sprawling 17th-century estate, the rooms and elaborate gardens have been featured in many design publications. Recent celebrity guests include Antonio Banderas and Melanie Griffith. Garden pool with Jacuzzi. Wireless connections. Secure parking. All suites have fireplaces. A full gourmet breakfast is served whenever and wherever you want it. The Tree House, reached up a steep stairway and through a trap door, is fun for people traveling with kids. Check rates and availability for the Casa de Sierra Nevada. Notes: Carved from nine colonial mansions dating from the 15th-18th century. Most rooms have fireplaces and balconies or private terraces. Two restaurants/bars. The pool is under renovation until August, 2007. Internet access in the library. This was the first of the real luxury hotels in San Miguel and they know how to do it! Get rates for Casa Linda and availability information here. Notes: Excellent tapas restaurant, Iberico, on the property and sunset Bar on the roof terrace. Indoor lap pool, steam room, 12-person jacuzzi, Cybex weight room. In-room spa treatments available. Recently completely remodeled with a more modern vibe. 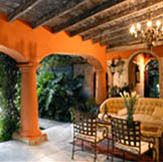 Get rates and other travel information for Casa Quetzal. Notes: Some suites include kitchenette with microwave, fridge, coffeemaker. Breakfast served in your room or on the terrace. Jacuzzi on the common terrace; wireless internet in common areas. Free parking. Find the best rates and compare prices for Casa Rosada. Notes: Created inside a beautiful 18th-century house directly behind the Parroquia. This was once the home of Guadalupe Rivera Marín, daughter of the famous Mexican painter Diego Rivera. Amazing views from the terraces. Cable TV, wireless internet, spa treatments, restaurant/bar, parking. Check rates and reviews for Doña Urraca Suites and Spa. Notes: Located just three blocks from the Jardín. The air-conditioned rooms include TV/DVD, wireless internet connection, coffeemaker/microwave/mini-fridge. There's a lap pool in the garden and parking is available. Check rates and availability for Dos Casas. Notes: Done in a spacious, almost spare, contemporary style. All rooms have fireplaces. The entire 5-bedroom house can be rented for groups. Free parking. No children under 12. Check rates and availability for the Oasis Hotel. Notes: All rooms have fireplaces and flat-screen TVs. Full breakfast served in your room, the dining room or on the terrace. In-room wireless internet. Free parking. One of the newest of the luxury hotels in San Miguel. Intimate. Check room prices and availability for La Puertecita Boutique Hotel. Notes: Hotel on many levels with steps, terraces and gardens. A 10-15 minute walk downhill into town (uphill coming back). Isolated and very tranquil and pretty. Restaurant with room service, bar, two pools, Jacuzzi, exercise room, courtesy shuttle to centro. Notes: Carved from a 17th-century colonial home that was owned in the 1940s by Jose Mojica, a Mexican opera singer and movie actor. Some of the most famous actors of his day came to visit, including John Wayne, Gary Cooper, John Ford and Pedro Infante. This was one of the first luxury hotels in San Miguel. The patio restaurant is an institution and very popular with locals, especially at Sunday brunch. Check room rates and availability for Hotel Villa Rivera. Notes: Most rooms have fireplaces. Swimming pool, bar, room service, valet parking. The patio restaurant is a favorite brunch spot with locals. Try the blintzes or Eggs Benedict. If you'd like something a little more affordable than one of these luxury hotels in San Miguel, click on the links below to go to another category in the Hotels Directory. Please tell your friends about the San Miguel Hotels Directory. And when booking a room, please tell the hotels where you found them.